William Hippisley, who died aged 51 in 1657, married Catharine, co-heir to her grandfather Sir Benjamin Pellatt; from him she inherited Truleigh, in Edburton, Sussex. They had a son John and daughters Catharine and Mary. From the elder daughter descended the poet William Cowper. His mother was Anne Donne, whose mother was Catherine Clench, daughter of Catharine Hippisley. As early as 1777 the inscription on the mural tablet had suffered the damage apparent today. 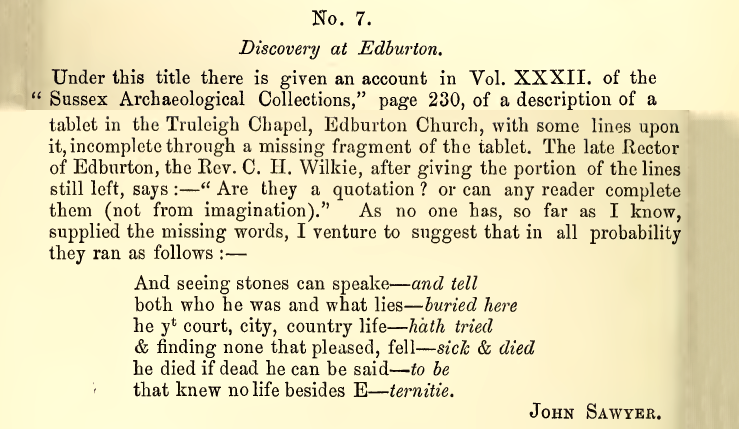 In June of that year the Reverend Charles Vaughan Baker, Rector of Edburton 1754-1784, supplied particulars of the memorial to William Burrell, that the latter recorded in his manuscripts preserved in the British Museum (Add.Mss. 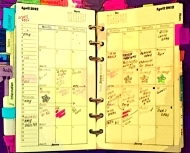 5698). It was on the north wall of the ‘Truly Chancel’ there was the coat-of-arms, and the imperfect inscription. At a date unknown the monument fell or was removed from the wall. One learns (Sussex Archaeological Collections XXXII (1882), page 230) that the tablet, previously lying in fragments, had, in the course of the restoration of the church at the time, been re-fixed in the Truleigh Chapel. 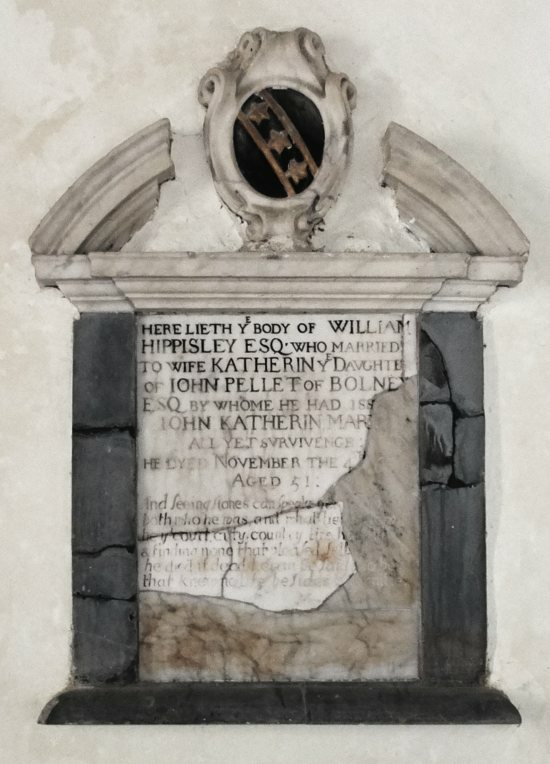 At a subsequent date, but not within the memory of any present parishioner [in 1958], the memorial was again removed and, until lately, lay in pieces at the west end of the nave. 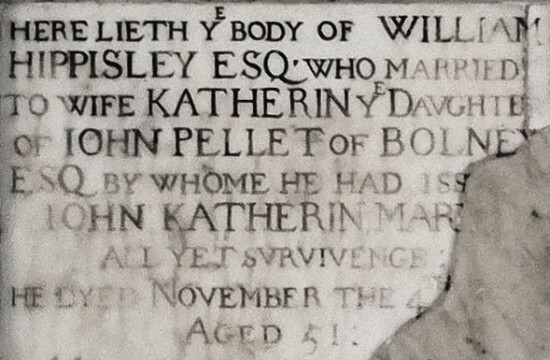 Here lieth ye body of William Hippisley Esq who married to wife Katherin ye daughter of John Pellet of Bolney Esq by whome he had issue John, Katherin, Mary all yet survivenge: he dyed November the 4th 1657 aged 51. And finding none that pleased fell ill.
That knew no life besides Eternitie. 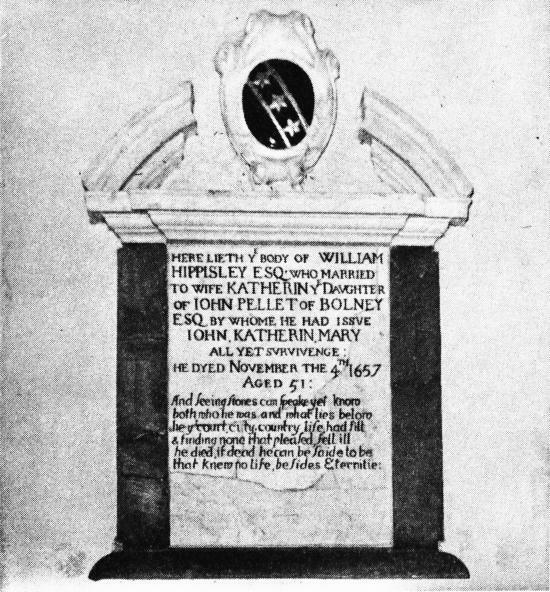 There are notices and pedigrees of the Pellatt family, with reference to William Hippersley or Hippesley, so spelt [in] Sussex Archaeological Collections XXXVIII, page 121 and opposite page 112, and in Elwes & Robinson Castles, Mansions and Manors of Western Sussex, part I, page 86 and opposite page 34. Of Hippisley I can find nothing, other than in the authorities I have mentioned. He may have been kin to the family of the name, of Yatton in Somerset, or to the family of whom there are memorials in the church of Lambourn, Berkshire (D. & S. Lysons Magna Britannica volume I, part II, page 309). The Hippisley Memorial [is] an attractive feature of Edburton church, if not an imposing one, interesting too, for the association with, in Hayley’s words, ‘that amiable man and charming author’, William Cowper. May William Hippisley have transmitted his melancholy and varied genius to his far-away descendant? The first half of this post comprises a very lightly edited version of an article that originally appeared in the January 1958 issue of St. Andrews Quarterly. The author was a Fellow of the Society of Antiquaries and a prolific writer of scholarly books on local and ecclesiastical history. His first book was published when he was just 22. Later works included Memoir and select letters of Samuel Lysons, 1763-1819 (1934); Beechcroft. The Story of The Birkenhead Settlement 1914-1924 (1938) with Horace Fleming; History of Pagham in Sussex: Illustrating the administration of an archiepiscopal hundred, the decay of manorial organisation and the rise of a seaside resort (1949-50) in three volumes; The little churches of Chichester: St. Peter North Street, St. Olave North Street, St. Andrew Oxmarket, All Saints in the Pallant (1957); The Church of St. John Baptist, Westbourne, in the Diocese of Chichester, Sussex (1958); and The Chartulary of Boxgrove Priory (1960) translated from the Latin and edited by LF. The son of Peter Fleming, a wealthy antiquarian and rare book collector who lived at Aldwick Grange in Bognor Regis, Lindsay Fleming retained the family home after the death of his father (c1933) and died there himself in 1966 at the age of 64. For very many years the Hippisley Memorial has lain in fragments in the Nave of St. Andrews Church, Edburton, and recently Mr. Lindsay Fleming very kindly wrote to the Rector, Reverend F.J. Cornish, suggesting that a memorial of such interest would be better if repaired (where possible) and re-sited and fixed in the wall of the church. After consultation with Mr. Francis W. Steer who is the County Archivist, the Rector, the Honorary Secretary of the Parochial Church Council and Mr. L. Anscombe, the monumental mason, it has been agreed that this work be done. Very many people, including visitors to the Church, have sought more information of the Memorial than given in the little pamphlet dealing with the history of St. Andrews Church, so we are happy to print a much fuller report, prepared by Mr. Lindsay Fleming himself. It may be some little time before the Memorial is refixed, but due mention will be made in the Quarterly. Apart from additional commas and the abbreviation of ‘that’ as ‘yt‘, the only change from Fleming’s conjectured verse is the replacement of ‘show’ with ‘know’ in the first line. 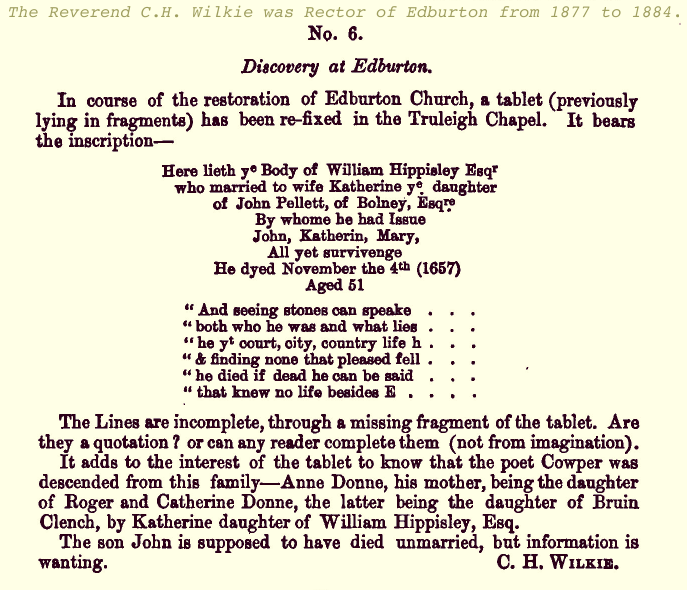 Howe’s book contains a couple of shards of additional information about William Hippisley: a reference to him as ‘WH of Hurstpierpoint’ (page 13) and a note of his summons to appear before the Quarter Sessions in early April 1649 — a couple of months after the execution of Charles I — for “divers seditious words and speeches” (page 21). William Hippisley was educated at Westminster, and became Fellow of Christ Church, Oxford. He travelled with the Duke of Buckingham as his tutor. He was nephew to Sir John Hippisley, of the Long Parliament. Sussex Archaeological Collections XXXV (1887), page 196.